8-Piece Nonstick Cooking Utensils Just $25.95! PLUS FREE Shipping! Score this 8-Piece Nonstick Cooking Utensils at Amazon for just $25.95 PLUS FREE shipping when you apply the extra $2 coupon located below the price! This cooking utensils set gives you everything you need to whip up enticing meals with remarkable ease! 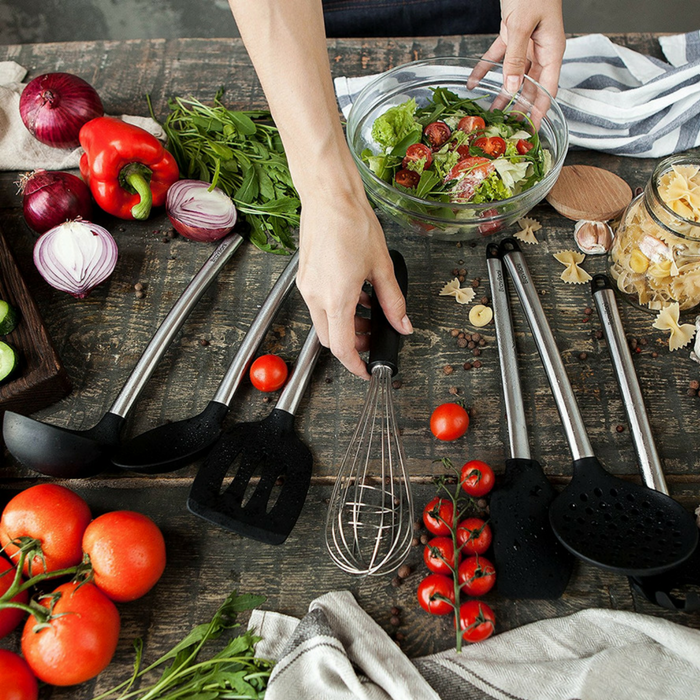 You’ll get a pair of tongs, turner spatula, flex spatula, pasta server, serving spoon, deep ladle, 2 stage whisk and a strainer to complement any dish. But these aren’t your regular utensils. They have designed the handles using high-grade stainless steel and made the heads with top-notch silicone, making these the most durable utensils in the market; offered to last you for a lifetime! No bending. No breaking. No rusting. Just unwavering service even with daily use. Awesome! Silicone heads are non-stick to make cooking much easier. Handles feel sturdy in the hand while still being comfortably lightweight. FDA approved to be 100% BPA and latex free and contains zero plastic. Quick clean without the silicone heads fading. Incredibly elegant design that will spruce up your kitchen.